An email signature is a piece of customizable HTML or text that most email applications will allow you to add to all your outgoing emails. For example, it commonly contains name and contact details - but it could also (of course) contain a link to a gospel tract. Great idea! Thank you. That cartoon tract was pretty good. The era of the religious pocket tract is over (religious traditions die very slow). The conversion themed, bullet point, pray this prayer, 4 steps religion is suspected by most outsiders as simply “join our group”. Instead of starting a conversation about Jesus, these little booklets often shut people down and turn them away. God is calling people to follow Jesus for a lifetime and to share our lives with real faith alongside neighbors, friends and family. Let’s not settle for a Cliff’s Notes version of the Gospels. Matthew, Mark, Luke and John are the unabridged real deal and the original tracts. A 1998 PBS Frontline said many scholars agree that the Gospels are neither biographies nor objective historical accounts, but they resemble religious advertisements. What an amazing observation! These scholars, attempting to belittle the Bible, are right on. The Gospels were written so that you might believe that Jesus is the Messiah (John 20:31). These original four stories of Jesus were long tracts designed to bring people to faith. They were not just historical or biographical in nature but intended to persuade men and women to follow Jesus In faith! Thank you for your comment Mr. Peacock. I think you have a good strategy there and think it is a good idea. 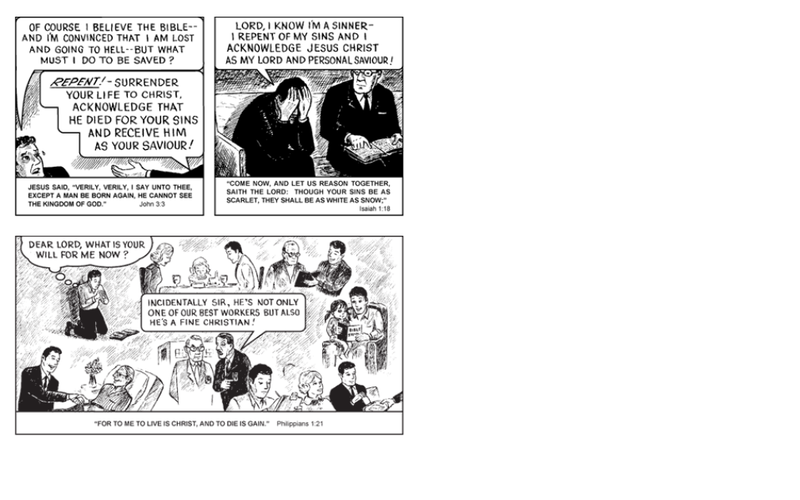 At the same time, God still can use simple things such as a cartoon gospel tract to bring someone to Jesus. But thank you for giving me something to think about and consider.